Takahashi FSQ-106ED @ f/5.0 (530 mm F.L.) Captured at 2.1 arcsec/pixel. Shown at 2.88 and 9.24 arcsec/pixel. 420 min. (28 x 15 min.) "
540 min. (36 x 15 min.) "
eXcalibrator v4.30 for (g:r) color balancing, using 168 stars from the SDSS-DR9 database. CCDStack to calibrate, register and stack the sub exposures and create the RGB image. PixInsight processing includes gradient repair, non-linear stretching with HistogramTransformation and selective use of HDRMultiscaleTransform to enhance the detail individual galaxies. PhotoShop for combining the images with varying galaxy detail, creating the LRGB and final touch up. The Coma Cluster (Abell 1656) is a large cluster of galaxies that contains over 1,000 identified galaxies. 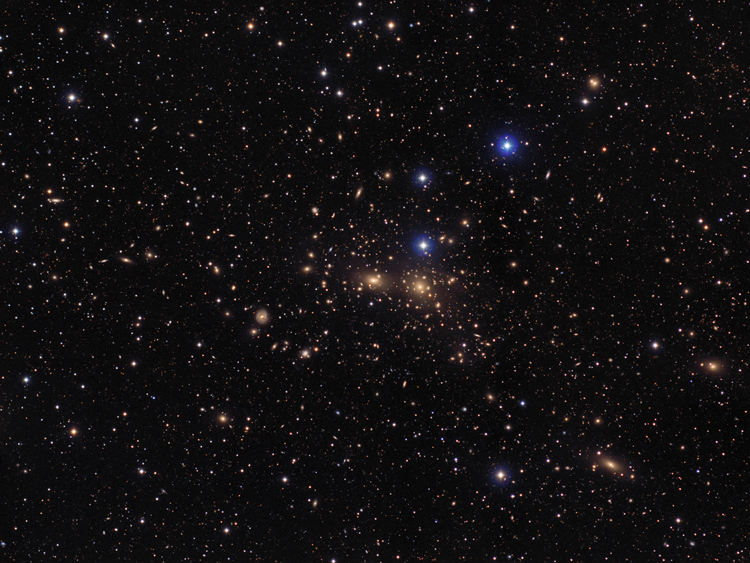 Abell 1656 and the Leo Cluster (Abell 1367) are the major components of the Coma Supercluster. At a distance of 320 million light years, the apparent extent of the cluster is three times larger than the Moon, half of which is shown in this image. The central region is dominated by two giant elliptical galaxies... NGC 4874 and 4889.